The Bank of England’s announcement that it would cut the UK interest rate from 0.5% to 0.25% was widely predicted by financial commentators and investment analysts, however the Governor, Mark Carney, warned that banks had ‘no excuse’ not to pass on the lower borrowing costs to customers, and will be fined if they fail to do so. The Bank’s Monetary Policy Committee (MPC) has not ruled out a further cut to the record-low rate if it feels the UK economy worsens in the coming months – it also reduced UK growth predictions for 2017 from the 2.3% it was expecting in May, to just 0.8%. Explaining the rate cut, Carney [pictured] stated; “We took these steps because the economic outlook has changed markedly, with the largest revision to our GDP forecast since the MPC was formed almost two decades ago.” The decision had been unanimous by all nine members of the Committee. 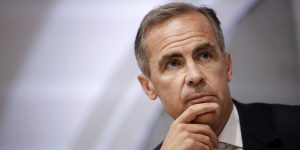 Carney also announced that quantitive easing will increase to £435bn following a £60bn bond buying commitment – with a corporate bond buying scheme becoming available to companies outside the financial sector, which are considered to be contributing to the UK economy. The Pound fell by 1.5% against the Dollar, and by 1.3% against the Euro following the Bank of England’s announcements, although the FTSE closed up 105 points at 6,740.16, which was higher than the same day last year. If you would like to talk to us about your investment following the rate cut, or our financial strategy in light of the referendum result, please call 0800 731 7614 and we will be happy to discuss any concerns you may have.